"No one in the town of Bonnyripple ever kept a grudge." With the exception of old Cornelius, the Grudge Keeper. The townspeople have always relied on Cornelius to take their written complaints and file them away. When Minnie's goat eats Elvira Boggs prizewinning zinnias, Elvira marches to the Grudge keeper to file a complaint. It doesn't end there. When a schoolboy snatches the schoolmaster's toupee, the schoolmaster files another offense. The numbers grow when Big Otto stomps on Lily's Belle's new shoes and she angrily throws her accusations at gentle Cornelius. The grudges pile up until Cornelius's home is crammed with them. One day a wind blows, sending the grudges tumbling every which way, leaving Cornelius buried in a mountain of them. The next morning the people of Bonnyripple set off for his cottage to file their new complaints. Will they pull aside the mess of grudges fast enough to save Cornelius? 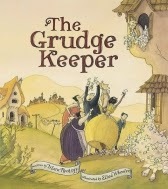 Playful wordplay, wit and beautiful ink with watercolor illustrations come together to create a delightfully charming story that will leave no doubt about how bad it is to hold a grudge. The look of burden and fatigue on the Grudge Keeper's face conveys what words never have to say. Hats off to both author and illustrator for capturing the magic while teaching a moral. Not many can pull it off and they do it with poise and beauty.